034Motorsport High-Flow Catalytic Converters are designed to replace the restrictive OE catalytic converter, and allow for quicker spool while increasing horsepower and torque throughout the powerband. We construct them from 304 stainless steel tubing, and utilize a high-performance 250-cell stainless-steel-matrix cat. They feature CNC machined flanges to prevent warping and expansion, factory-correct exhaust hanger location, and 2 oxygen sensor bungs in the proper locations for the factory sensors. Full 3" tubing is used throughout. Complete drop-in upgrade; will bolt up to any stock/stock-fit turbo and stock/stock-fit exhaust. Professionally assembled in-house, TIG-welded and backpurged. - Full 304 stainless construction. - TIG welded and backpurged. - Factory correct oxygen sensor and exhaust hanger placement. 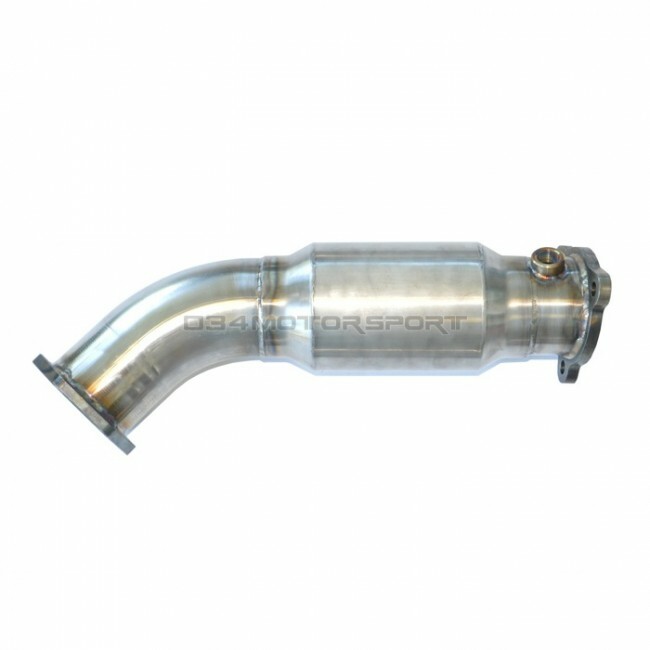 FITMENT: Direct bolt-in for OEM cat-back exhaust, or aftermarket cat-back exhaust systems designed to fit with the OEM catalytic converter. Will fit 4Motion/quattro and FWD B5/B6 Audi A4 1.8T, and B5/B5.5 Volkswagen Passat 1.8T models equipped with Manual, Tiptronic, or CVT transmissions. Please select your transmission type from the dropdown below. Gasket & Hardware Kits **NOW INCLUDED!!! ** - We have pieced together all of the necessary parts to make swapping out your factory catalytic converter a breeze. This kit includes turbo outlet and cat-to-midpipe gaskets, as well as all necessary nuts and bolts for a complete install. Oxygen Sensor Spacer **NOW SOLD SEPARATELY**- This spaces out the secondary (rear) O2 sensor to remove MIL or CEL issues caused by removing the factory catalytic converter. Professionally manufactured from stainless steel, not cobbled together by hand like some other products on the market. Spacer will add approximately 1.7" to the height of the sensor. 034Motorsport oxygen sensor spacers feature a flare seal seat, so no sealing washer or gasket is required. Select your transmission type from the dropdown below.